Conspiracy theories about recent and even more distant historical events have become ever more widespread, especially with the growth of the Internet. One such theory, generally known as "Holocaust denial", claims that professional historians, the mass media, and governments have conspired to suppress the truth about the Nazi extermination of the Jews during the Second World War - which is that it never happened. How has this theory come about? Who supports it , and why? How do its proponents deal with their critics? What, if anything, could or should be done to combat Holocaust denial? This talk draws on the speaker's experiences as an expert witness in a High Court libel case to suggest some answers. Richard J. Evans is Professor of Modern History at Cambridge University. His books include "The Coming of the Third Reich" and "The Third Reich in Power". He has taught in adult education at Birkbeck, and at Gresham College, and contributes occasionally to radio and television, most recently to Radio 4's "In Our Time" and Channel 5 televsion's "Hitler Speaks". 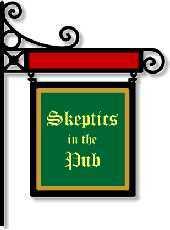 Skeptics in the Pub meets once every month at the Penderel's Oak, Holborn. A £2 donation is requested to cover the guest speaker's travelling expenses and sundries. Non-skeptics are welcome. Turn up at any time during the evening.